Anyone with even a slightest interest in the tech world will have been unable to avoid a couple of big stories over the past few days. RIM, maker of the Blackberry phone ecosystem, has had a major outage of their service, and Apple has released several new updates as well as a new version of the perennially popular iPhone. I’m not concerned about RIM. I am not particularly concerned with Apple’s new shiny. I am concerned about steadily having my hand forced to upgrade beyond where I am comfortable. I am talking about system requirements for a couple of the new things emanating from Cupertino. Let me set out my table. I am a “creative”. I use a Mac for business and pleasure. My Mac is not in its first blush of youth, but it is still quite capable. I am reliably informed I can install the latest version of the Mac OS, version 10.7 aka Lion, and get some more miles under the belt before I need to seriously consider scraping together cash for a new machine. All of which is very nice. Lion is available from the App Store for not much more than a round of drinks or a Saturday night takeaway. A couple of clicks and away I go. The thing is, I still use software that relies on some core technologies of older versions of the Mac OS. Apple were incredibly clever when they transitioned from the PowerPC CPUs to Intel back in the day. They engineered code into the OS so it transparently rewrote the PowerPC code in older applications for Intel chips on the fly. You could continue to use older software until the developer updated for the Intel code. Which was (and is) amazing when you think about it. In the intervening five or six years, most of the applications I use on a daily basis have been updated, and now run on Intel architecture. All, that is, save one or two. My Canon scanner, for example, will never be updated, and even a third party front end software requires the drivers to be present which—wait for it—are PPC architecture. I can get round this, as I have another scanner now, but I can always run it on an older Mac that is unrepentently a PowerPC powered machine. The other one, which is a bit bigger in my world, is Macromedia FreeHand. Don’t laugh! I still use it, even though Adobe bought out the company and let FreeHand expire in a dusty corner. I use FreeHand because — oh, let’s not go there. It’s not pertinent to this ranty post anyway. Okay, the FreeHand thing can also be solved by shifting it to that older PowerPC Mac I’ve already mentioned. That’s not the point, really. My point is Apple have just released updates to Aperture, which I use nearly every day for managing my photo libraries and so on. That’s good, yes? 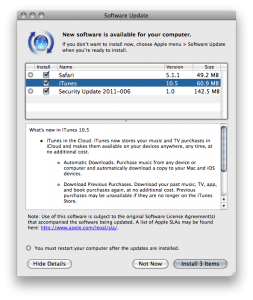 Yes, if you have updated to the latest version of Lion. Otherwise, you don’t get the update to Aperture. I don’t actually think I need Lion. From what I have seen, it doesn’t offer me anything over what I am running now (OS X 10.6.8 Snow Leopard). Apple, it seems, are forcing me to upgrade to an OS I don’t really want or need in order to keep up with software I do want and need. There’s also this thing called iOS5. This is the latest version of the operating system for iPhones, iPods touch and iPads. Lovely shiny things I don’t own. Along with the iOS update is a change from MobileMe, which I use, to a thing called iCloud. Guess what? I can’t migrate to iCloud without running OS X 10.7.2 or iOS5. My hand is being forced into making an upgrade to something I don’t really want to upgrade. Yet to maintain levels of software I use, I don’t seem to have much choice in the matter. Not wishing to speak ill of the dead, but is this the Apple that Steve Jobs always meant it to be? 19 October 2011—Apple quietly rolled out the Aperture 3.2 update on the App Store. The update was “recommended” for all users. In the system requirements, the magic numbers 10.6.8 appeared. 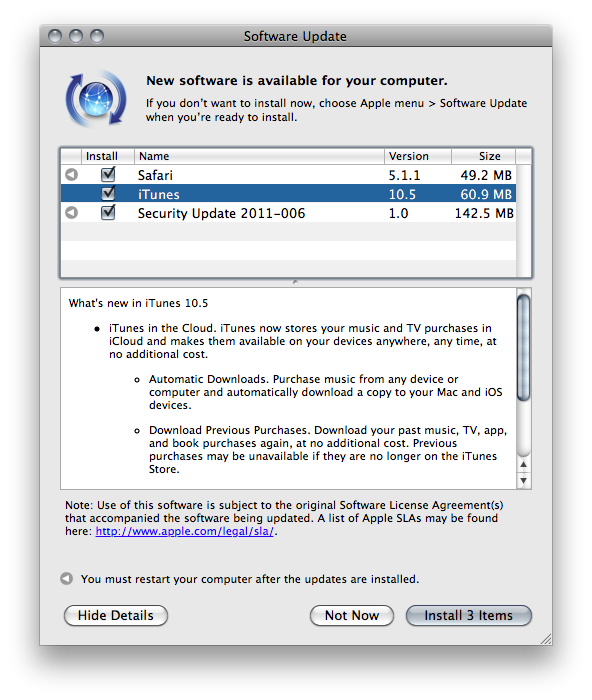 I checked all over the Apple web site to confirm the 3.2 update would work for Snow Leopard, and happily it does. The only requirement for me to sidegrade to Lion now is if I want to keep my @mac.com email address, and I have until the end of June 2012 to sort that out. I’m sorry. I’m fed up. Everywhere I turn at the moment, I’m surrounded by iPhone and iPad noise. Almost every photography podcast I subscribe to has become iPad crazy. I can’t move for tweets or blogs about apps for this, that and the other. It’s not I don’t appreciate the technology. Obviously, developers and users have found Nirvana in the Apple shiny things, and good luck to them. The problem is more that I am unable to follow where my digital mentors are leading. I can’t afford an iPad. I can’t afford an iPhone. Therefore, it strikes me that I am now a second class citizen. Once the iFad has passed, I hope the podcasters and bloggers I follow will settle back into the business of helping me make pictures, and preferably without referring me to their latest app.